Hi there! I am popping in quick with a few pics of some items I ordered online as well as a few of the items from the small rollout last week. I finally got around to taking some photos of the online order so figured I would share everything at once! First up is the Tie-waist skirt in seaside floral which I paired with the New perfect fit t-shirt in neon petal. I’m wearing a size 8 and it was a little loose so I would say it runs a tad big. This print also comes in a tie-shoulder peplum top. It is the same material as the Ruffle top in clip dot. Again, I appreciate the length of the skirt but I don’t want all my skirts to tie at the waist. The colors will work with a myriad of options. I went with pink but I also contemplated something in the more olive family or aqua and all of those seemed to work. This was a pass for me. This t-shirt is a love for me – I already have it in a few colors. As you can see, the neon isn’t quite so neon but the darker pink in this tee, the neon brilliant azalea is pretty bright. I like the longer sleeves on the tee. This is a medium which is good for every day wear. Next up, from my online order, the Pencil skirt in neon fuchsia tweed. I’m wearing an 8 and it was a little snug. I like the length but the color was a little bit off for me and the tweed felt less substantial and not worth the price. I’d consider it on sale. It was a little too pink and not enough fuchsia for me. It seemed like it would snag easily as well. Next up, the Tall Striped Tie-Waist Top which I’m wearing with the Lookout high-rise jean in white. This top is currently sold out but I’m sure you’ll be able to catch popbacks online at some point. This and the white sold fast so I ordered the 6 tall in this and the 8 in the white to try. The 6 tall worked so I didn’t even attempt the white one. The striped one is a bit sheer and there is a lot of tie but I tried to keep it in tact when I wrapped it since I always get confused with how they are supposed to tie. Even though it’s sheer, someone on the JCA blog made a good point that it’s the perfect weight for summer. I think this is a keeper for me. The only annoying thing is that it needs one more button and it gapes open at the bottom of the shirt. See what I mean? Nothing a pin or a snap can’t fix but…one more button would have done the trick. Next up, the tall Lace-up shirt dress. I had last year’s version of this dress minus the lace up top and I loved it. I needed the tall length last year and this year the regular length was also too short for my liking. This is the tall medium which worked well. 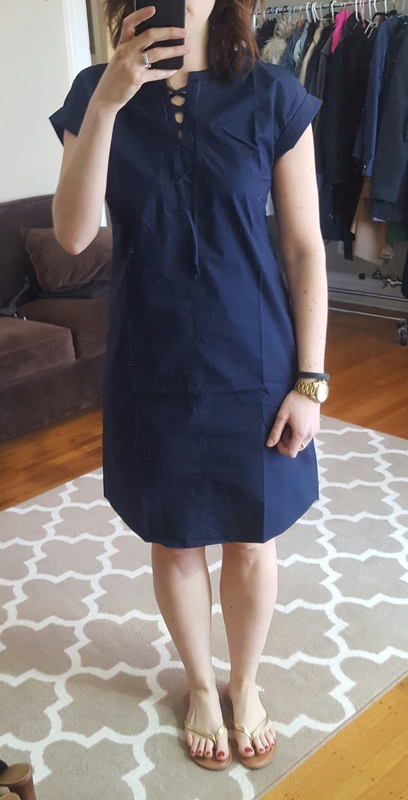 This is such an easy toss on and go summer dress. It also comes in white and black but the white is probably a bit sheer and will appear wrinkly quickly. I had the black last year so decided to change it up with navy. Next up, the Tie-neck top in Oxford cotton from this most recent rollout. This also comes in a light yellow. Initial reviews said to size down. My size in tops these days seems to be a 6 or an 8 and I ended up wearing a 4 in this. The regular length was pretty long which was nice but it does also come in tall length or petite. I would need a strapless bra. I wasn’t sure exactly how the tie was supposed to go but the stock photos online show it tied with a bow in the back. I tried to tie it around the front but there’s not enough length. I’m wearing the top with the Slim Broken-in Boyfriend Jean. I think this one will make it’s way in to my closet. It’s a decent weight cotton with a bit of a sheen. Lastly, the Tippi Short-Sleeve Sweater with Tulle in muslin. This also comes in heather mint. This was a meh for me. It’s a little short (this is a small) so the medium would have given me more length but the color wasn’t working for me and the ruffles just weren’t doing it for me either. I am sure some people will be able to pull this off but I am not one of those people. Well, there you have it. Some short “reviews” and more try-ons from the latest J.Crew rollout. Any favorites? Would love to hear what you think and thanks for stopping by!